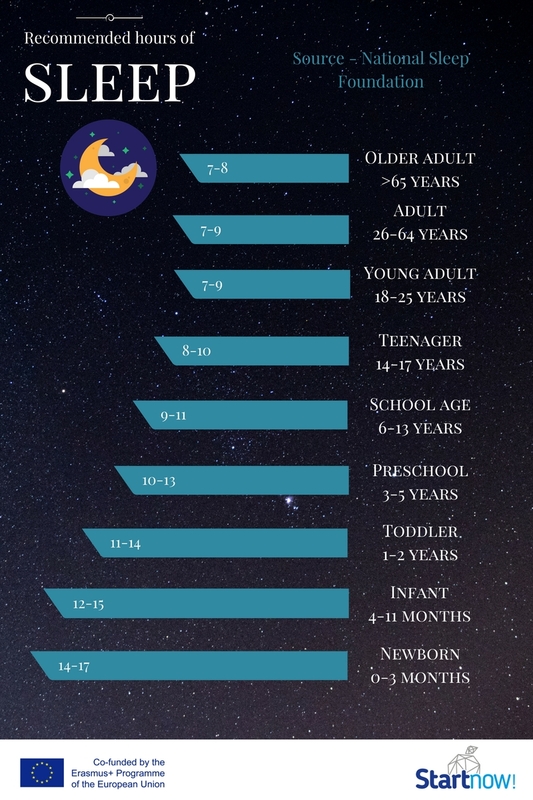 The power of sleep – Start now learning! This exercise can be used as an introduction to the topic – The Facilitator can explain that the aim of the „Circle massage” is for participants to relax and gain calmness – as this is one of the roles of sleeping. The Facilitator reads out loud 12 statements, one by one. Each participant, has to decide whether each statement is true or false by marking their answers next to it. Sleeping just one hour less at night can prevent you from learning or functioning normally. Boredom makes you feel sleepy, even if you have had enough sleep. Resting in bed with your eyes closed cannot satisfy your body’s need for sleep. Snoring is not harmful as long as it does not disturb others. No matter how sleepy you are, you can force yourself to stay awake. If you are sleepy, raising the volume of your radio is a great way to stay awake while driving. Sleep disorders are mainly due to stress, worries or psychological problems. The human body never adjusts to night shift work. Most sleep disorders disappear even without treatment. False. While your body rests, your brain does not work. An active brain during sleep prepares us for alertness and continue functioning the next day. True. Most adults need around eight hours of sleeping to function at their fullest capacity. To determine your sleeping need, sleep until you wake up on your own…without an alarm clock. Feel alert? That’s your sleeping need. You can teach yourself to sleep less, but not to need less sleeping. False. Sleep loss causes sleepiness. Boredom, like a warm or dark room, merely unmasks it. True. Rest is not a substitute to sleeping. Sleeping is as necessary to health as food and water. When you do not get the sleep you need, your body builds up a sleep debt. Sooner or later, this debt must be paid… with sleeping. False. Snoring may indicate the presence of a life-threatening sleeping disorder called sleeping apnea. People with sleeping apnea snore loudly and wake up repeatedly during the night, gasping for breath. These repeated awakenings lead to severe daytime sleepiness. Many people with sleeping apnea are unaware they have this condition. True. Though many people fail to remember their dreams, dreaming does occur for every person, every night. Dreams are most vivid during REM or rapid eye movement sleep. False. Sleeping need remains unchanged throughout adulthood. Older people who sleep less at night tend to sleep more during the day. If poor sleeping habits, pain or health conditions make sleeping difficult, a physician can help. False. If you are sleepy enough, you can fall asleep anywhere. it is also possible to fall asleep for a few seconds and not even realize it. These “microsleeps” can be dangerous if they happen when you are driving. False. Playing a radio, chewing a gum, and opening windows are not great ways to keep sleepy drivers alert because their effects are short-timed. If you are having trouble staying awake while driving, try to pull over at a safe place and take a short nap or have a caffeinated drink. The best solution is to drive after a good night sleep. False. Sleep disorders occur due to a variety of causes. Sleeping apnea, for example, is caused by obstruction of the airway during sleep. Narcolepsy is characterized by severe daytime sleepiness and sudden sleep attacks, and it appears to be genetic. No one knows yet what causes restless legs syndrome, in which creepy, crawly feelings arise in the legs and are relieved, momentarily, by motion. True. All living things (people, animals, even plants) have a circadian or about a 24-hour rhythm. This affects when we feel sleepy and alert. Whether you work a night shift or not, you are most likely to feel sleepy between midnight and 06:00 am. Therefore, a shift worker’s circadian rhythm never adjusts. False. Sleep disorders do not disappear without treatment. Treatment can be based on behavioral modes (for example, going to sleep and waking at the same time every day), pharmacological, surgical or a combination. Untreated sleep disorders may have serious consequences in your health, quality of life, school or work performance, and relationships. In the worst-case scenarios, untreated sleep disorders can lead to accidents and death. why people need to sleep a certain amount of time? how do you feel if you sleep too much/too little? The last question will naturally lead to the next exercise. 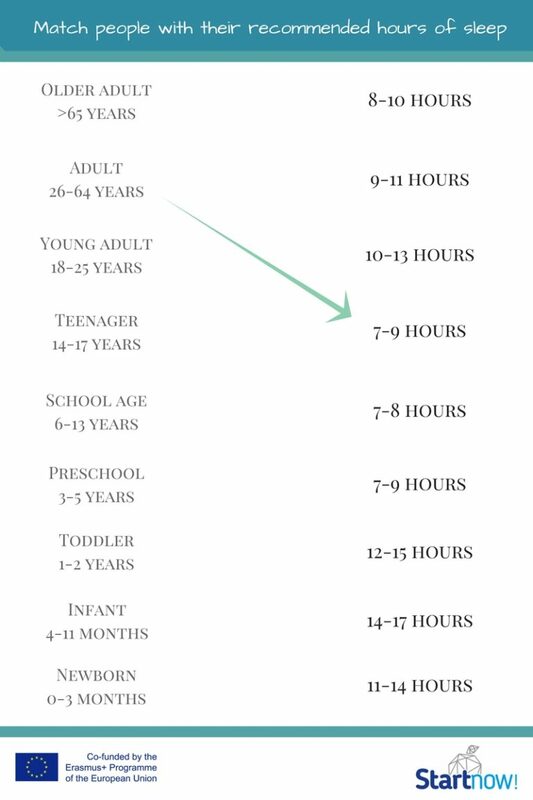 Appendix 1: "Recommended hours of sleep - task"
Appendix 2: "Recommended hours of sleep"
Group 1 – What happens in your brain and body when you sleep? Group 2 – What happens when you don’t get enough sleep? Students are free to use any source that is relevant – not only those which are given as an example. After they are done with their task, they present it to the others. The Facilitator should make sure the presentation is prepared with graphics, so they can be hanged in the room. After all the activities, the Facilitator asks each participant to come up with 1 idea on how to make their sleep better – and writes them as a list on the flip chart. In this evaluation activity group will create their own advice chart, which later on can be printed out and used as a dissemination product. This activity can be done at home in smaller groups or in the school, youth clubs etc. The Facilitator encourages students to organize an event „Sleeping over” and asks them to arrange activities (like watching films, playing board games, having a SPA corner – massages, masks etc.) food, materials – so the whole group (or smaller groups at homes) can spend some evening time together and later on sleep in the space where they usually learn or do other „daily” things. The group should also take care of promoting the event – creating a poster, press release to the local media/or Facebook fan page. This activity also helps children’s integration and involvement in the project Taking photos of the event is required to be disseminated through social media as promotion of Health Education and the project. Make sure everybody will respect the dress code – PYJAMAS! This activity can be performed at home individually or in groups during the workshops. The Facilitator introduces lavender oil as a natural way to help get calmer sleep and invites students to prepare a „homemade” oil by themselves. The Facilitator and participants must take care of their safety and hygiene. After preparing the oil, participants are asked to design the etiquette (with the logo and the tittle of the project) and decorate the jars to look nice. Participants are also asked to take photos of the workshop and their jars and later on post them on social media tools. Pour the oil into a heavy saucepan. Add lavender flowers. Stir to mix the ingredients. Warm slowly over low heat. Once warmed, turn off heat and let the mixture to sit for 20 minutes. Place cheesecloth over measuring cup and secure with a rubber band. Strain lavender/oil mixture through cheesecloth. Once most of the oil has dripped through, remove rubber band and pull the cheesecloth around the lavender. Squeeze any excess oil into the measuring cup. (Have a towel nearby; your hands are going to be oily!) Put a few inches of water into pan, place cup (with olive oil) into pan. Warm slowly over low heat until the water is simmering. While the water is warming, add the 5 drops of lavender essential oil and 2 tablespoons of beeswax to the olive oil. Let this mixture sit in simmering water and stir occasionally until the beeswax has melted. This takes about 10 minutes. Once melted, pour into clean jars. Allow it to cool completely before putting the lid on. The mixture is maintained from 6 months to a year.